Case in point is the just underway but called to an abrupt halt after only one day Fort Hood Massacre trial…a court-martial actually for the man charged was and still technically is an Army Major (who is receiving his military salary which as of now stands at $300+ thousand). And what a farce of a trial this is as it’s based on a charge of ‘workplace violence’…which we all know it was anything but ‘workplace violence’ for what this miserable excuse of a man did was commit a terrorist attack on American soil and NOTHING less. 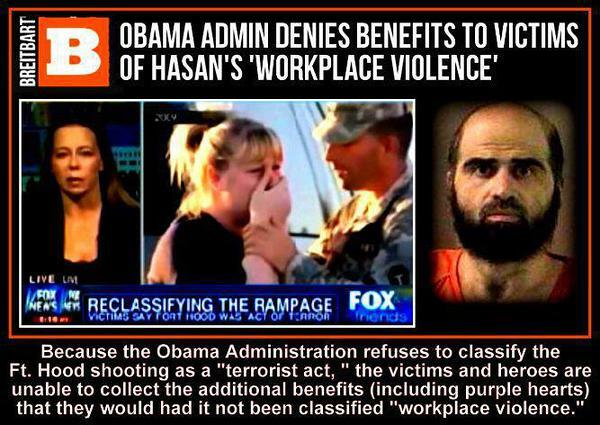 A terrorist attack committed by a muslim jihadist who called himself a ‘mujahedeen’ (a muslim holy warrior), Nidal Malik Hasan freely admitted he committed the attack calling it jihad…a muslim holy war against Americans…yet this administration…this president… refused to classify it as such even after the murderer’s (and I refuse to say ‘alleged’) own admission as proof of his intent…refused it because this equally miserable excuse of a president sides with those out to kill us. And guess who is actually footing the $5 million bill for this charade of a trial that could take months to complete…yup you guessed it…”We the People’…the American taxpayers…are getting taken to the cleaners yet again. And adding insult to injury is the fact that when military judge Col. Tara Osborn ruled that this most vile man could defend himself, and thus call the victim’s families and those who survived his rampage to the witness stand to be cross examined…allowing Hasan to taunt and ridicule those whose lives he changed forever…this became NOT a trial for murder…in fact for 13 counts of premeditated murder and 32 counts of attempted murder…but a stage for proselytizing and in defense of islam and NOTHING more for this man is guilty as charged…and NO prolonged expensive trial is needed to prove it. 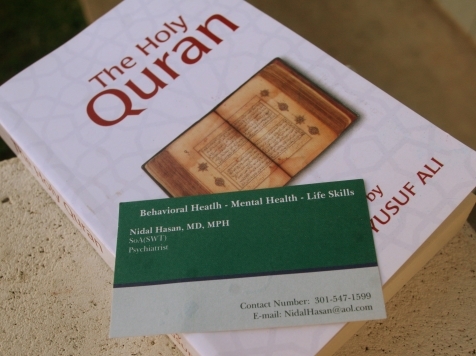 Proselytizing and defending islam even though the media and the Obama administration still refuse to acknowledge that islam had anything to do with the murders, even though Hasan has claimed that he shot his victims in defense of the Taliban leadership in Afghanistan. Can’t get any more islamic or jihadist than that now can you. And in Hasan’s opening statement before a panel of 13 senior Army officers including nine colonels, three lieutenant colonels, and one major….islam very much was in play as Hasan’s very words laid the ground work for the crux of this trial being all about islam and NOTHING else. “The evidence will clearly show that I am the shooter…Witnesses will testify that war is an ugly thing. Death, destruction and devastation are felt from both sides, from friend and foe. Evidence from this trial will only show one side. I was on the wrong side, but I switched sides” he said…switching sides and following the tenets laid down in the qur’an…’kill the infidels wherever you may find them’ (Sura, 9:5). And the infidels Hasan chose to target were military ‘supposed’ infidels for he seemed to spare civilians, all while yelling the standard jihadist battle cry, ‘Allahu Akbar’…’God is great’…as he mowed them down one after the other…one after another and all because he was about to be deployed to Afghanistan and didn’t want to go. So instead, he took it upon himself to follow what he believed to be his jihad call to duty to kill as many US soldiers as possible in his self-described war between America and his so-called islamic faith. And while Hassan faces lethal injection if convicted of all the murder charges (a unanimous guilty verdict is required for execution but keep in mind that the military has NOT executed an active duty US serviceman since 1961) that decision would be subject to years…maybe decades…of complex legal appeals as he sits in jail and grows old…and again guess who foots the bill for all this…none other than we American taxpayers. But what of the families of those murdered and the survivors who are going through hell having to sit through this sham of a trial with many still bearing the scars of that day…they get NOTHING from our government for surviving a terrorist attack…NO Purple Hearts that would have allowed them to get medical aid and benefits many still need…and all because Barack HUSSEIN Obama said this attack was ‘workplace violence’ and NOTHING more, thus giving more considerations to the shooter than to the victim’s families and survivors. Par for the course for this administration I’d say. And now with Hasan’s court appointed standby attorney Lt. Col. Kris Poppe accusing Hasan of deliberately trying to secure a conviction and death sentence (thus completing his wanted circle of jihad), because by acting as his own attorney in the way that he is in a manner that "we believe is repugnant to defense counsel and contrary to our professional obligations”…the trial came to an abrupt halt after only one day. Get your popcorn ready folks, because this trial will be long, drawn out, and one for the books for sure. And our Vets go without the help they need. Unemployment is lowered 20% because of sequester. And on and on it goes against We The People. EXACTLY...and Congress does NOTHING because they're all afraid of the race card being used against them...cowards. This is a Major. He is standing for his faith. islam is NOT a religion...it's a barbaric, suffocating, political system hiding behind the guise of calling itself a religion. Wow. You're a horrible human being Diane. There's no possible way that you can call yourself a Christian. You are the opposite of a follower of Christ. It's obvious who has a firm grip on your soul. I so agree and do it NOW...guilty as charged! flip. . . . flop. . . . He IS guilty. He admits it. He wants to be a martyr. He wants to 'die for his cause'. Let's take him at his word, stop the bull sh*t, AND KILL HIM NOW. It would save a WHOLE LOT OF MONEY AND UNNECESSARY HAGGLING. iT'S TIME TO TAKE OUT THE TRASH.